PAGE UPDATED: 16th November 2003. ANOTHER OPPORTUNITY ! CLICK ABOVE TO EXPLORE !! This winter in particular, gives England's Cricket Supporters the wonderful opportunity to watch top class International Cricket, on an island famed not only for its astonishingly varied natural beauty and wide array of special interests, but also vestiges of the ancient rich civilization five centuries before Christ that are abundantly extant today. 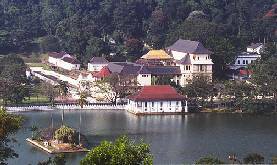 Colombo, Kandy, Dambulla and Galle, all provide stunning scenic locations for International Cricket and the contrast between golden beaches and misty mountains, tropical forests and shimmering blue waters of the Indian Ocean fringed with coconut palms, makes for a highly diverse and a memorable holiday in your life ! One could never select a better time than the months of November and December to visit Sri Lanka, although still at around 28°C and 80% RH (other than in the salubrious hill country) to offer you the best possible climate to enjoy both, Cricket and Travel here. In fact there are opportunities here to tailor-make your own itineraries, even perhaps to extend your stay or up-grade your hotel, for example. Savour the diversity and charm of this unique Island and....... you are certain to return again and again, like tens of thousand of others before you ! BOOKMARK this page. We shall update it often to Provide Information and Impart Knowledge and Education on individual facets of Sri Lanka. Cricket played out against a backdrop of the Islanders' passionate love for the game, the lush green of the world's 'Tea Garden' you will see in travelling through the scenic Hill Country with its cascading waterfalls and mountain passes and then the 'Royal City' of KANDY with the magnificent 'Golden Roofed' Temple there which house the most sacred tooth relic of the Lord Buddha, all combine to create a cultural experience, second to none! DAMBULLA a world heritage site and also a sacred pilgrimage site for 22 centuries is the cradle of our proud culture and civilisation. This newest venue to International Cricket in this Country, is the home to a series of spectacular BC Rock-Caves and over 22,000 square feet of Buddhist murals. 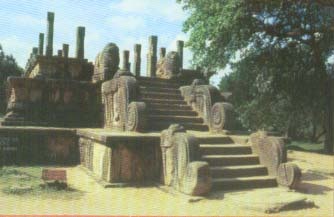 It is the largest, best-preserved cave-temple complex in Sri Lanka. 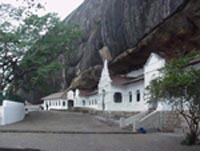 Five caves that form the Raja Maha Vihara of this village, by far is the most impressive. Each cave is decorated with mural paintings of scenes from the Buddha's life. Largest cave carries some 48 statues of Lord Buddha alone The Buddhist mural paintings (covering an area of 2,100 sq. m) are of particular importance, as are the 157 statues. 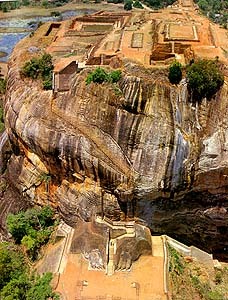 SIGIRIYA, its nearby town 16 Kilo Meters away, displays well Sri Lankan architectural tradition. It is also the best preserved city centre in Asia from the first millennium and displays the grandeur and complexity of urban-planning in 5th century Sri Lanka. The Complex consists of the central rock, rising 200 meters above the surrounding plain, and the two rectangular precincts on the east and the west surrounded by two moats and three ramparts. It has a combination of buildings and gardens with their trees, pathways, water gardens, the fusion of symmetrical and asymmetrical elements, use of varying levels and of axial and radial planning. The water garden, moats and ramparts are based on an echo plan duplicating the layout and design on either side. Its spectacular rock fortress built atop a 250 meter high rock by a 5th century Sri Lankan King, fearful of enemy invasion, with water gardens and royal mansion along with fresco gallery of heavenly maidens, are of world-wide renown and now termed the "Eighth Wonder of the World". OLD DUTCH FORT WITH RAMPARTS. 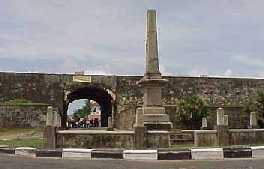 The port town GALLE, is the capital of the Southern Province, 115 Kilometers south of Colombo. It is famous for its 36-hectare old Dutch Fort with ramparts which is now a World Heritage Site and unique for its well preserved 17th century Dutch monuments, hand made lace work, ebony and ivory handicrafts, wood carvings, tortoise-shell ware and now even gem-polishing. The Galle Clock-Tower built in 1881 by the British and standing on the Dutch Moon Bastion, greatly enhances the beauty of the ramparts. 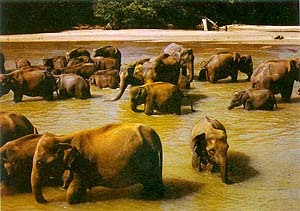 On way to Kandy - Elephant Bathing at Pinnawala. The beauty of the Island has encouraged Tourists to return again and again and each time to discover new things that bind them more. Legendary makes so many to believe this island to be the mythical 'Garden of Eden'. When you travel around, it is easy to see why. From the heat of the plains to the cool of the forested hills, from the gem-encrusted hills of Ratnapura to the sun smiling wide sandy beaches that fringe the island, this is where sea and serendipity, mountain and myth, and rain and religion, are all interwoven into one amazing tapestry. In fact this Island is 'a small universe', as it contains as many variations of climate, scenery and culture, as some countries a dozen times its size. What you get from it, depends on what you put in to explore it ! 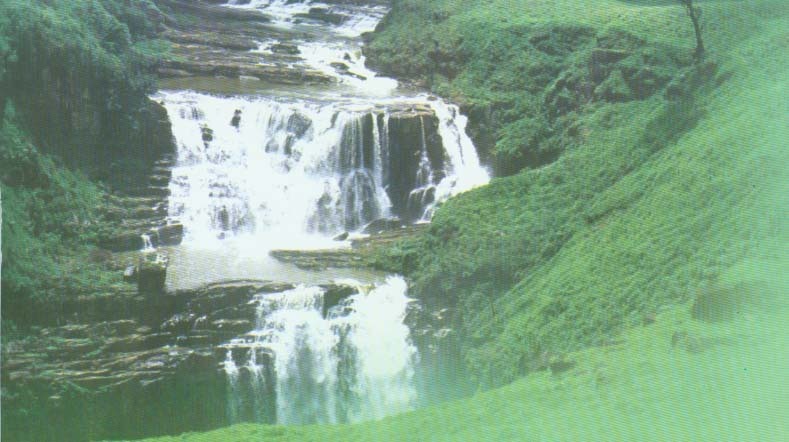 A WATERFALL IN A TEA ESTATE. Kandy nestled amongst green hills with the lake as its centrepiece, then to Nuwara Eliya only 69 Km from there but of nearly a two hour drive (because of steep climb) through verdant Tea Plantations and Water Falls and returning through world famous Gardens at Hakgala (10 Km away), are a must for those who love the hills and want to enjoy the salubrious climate. UNAWATUNA - 10 MINUTES DRIVE FROM GALLE. ONE OF THE WORLD'S BEAUTIFUL BEACHES. The Southern Coast starting from Kalutara and extending up to Tangalla, is the most popular beach resorts with more than a dozen beaches varying from one another, to enjoy the sun and sand amongst groves of coconut palms, take in the delicious sea food, revel in all water sports and observe the marvels of Indian Ocean, in passing through Bentota, Hikkaduwa, Galle and Matara. 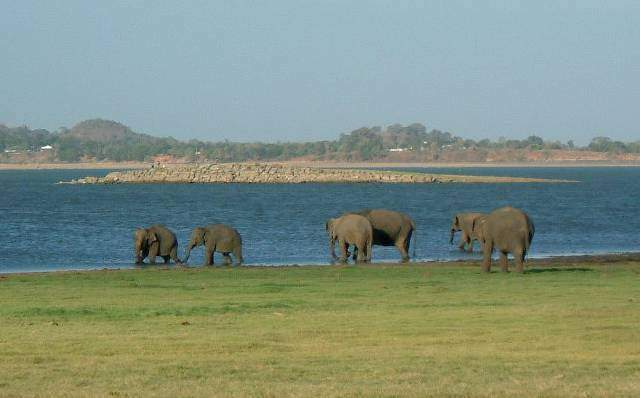 Spend a day with the untamed beauty of the Yaala National Park in search of the Elephant, the magnificent mammal whose population is fast dwindling and the elusive leopard. Deer, wild boar, sambar, flying squirrels and wide variety of birds, are all there in this 500 square-mile sanctuary. A two day trip to Islands ancient historical sites or the ruined cities encompassing Anuradhapura and Polonnaruwa, now Worlds Heritage Sites, is a worthwhile expedition of great educational value. To know how variety of gems found in the Island are mined then cut and finally polished, take a full days excursion to Ratnapura, the 'City of Gems' situated 101 Km from Colombo. Sri Lanka has plenty of tempting wares to offer for shoppers, and what is best is that there is something to suit virtually every budget. Gems, batik, handicrafts and now clothes are amongst the best buys here. Tea is synonymous with Sri Lanka as the Island remains the worlds largest exporter of high-quality 'Ceylon Tea'. An aromatic range of spices constitute the heart of the Sri Lankas cuisine. With the establishment of shopping complexes in Colombo, there are now shopping hubs where a wide variety of well displayed and attractive items are available. All the major credit cards are accepted at all leading business establishments. A word of warning !! My past experience indicates that flights and accommodation become fully booked many months in advance of (November - May) the peak tourist season here. It becomes worse in case of a Cricket Tour by a major cricketing nation. Already most of the 'out of Colombo' Hotels are over booked due to the unexpected heavy demand for accommodation. However, the Ceylon Tourist Board and the Sri Lanka Cricket Board are taking all possible necessary steps to meet the requirements of the expected tourists during the forthcoming England cricket tour here. Still they are shortage of rooms for about 2,500 more visitors expected. In fact Prime Minister Hon. Ranil Wickremasinghe has come to the rescue by making available the 'Government Circuit Bungalows' to meet the excessive demand for accommodation to manage the greater influx of tourists expected. For this reason, I strongly urge those still 'dreaming and are uncertain' of joining the Cricket Carnival here during the AUSTRALIAN TOUR of Sri Lanka in February 2004, please, to make up your mind very very soon and advise your travel agents all your cricket and travel requirements, to avoid disappointment. I understand that a couple of Five-Star Hotels in Colombo, are still able to offer very limited number of rooms on first come first served basis, for any one still thinking of joining us here for the England tour. Contact Hotels directly. You may quote this Web site notice. FACT FILE OF SRI LANKA. Democratic Socialist Republic of Sri Lanka is a separate independent Island in the Indian Ocean off the South-Eastern shores of India, situated 880 Km north of the Equator, (between 5° 55 and 9° 50 North, 79° 42 and 81° 52 East). We are 06 hours ahead of GMT. Taprobane, Zeilan, Serendib and Ceylon are few of the Islands plethora of former names. It is 435 Km in length, 225 Km (maximum) in breadth and 65,606 square Kilo-meters in size. It has a population of 19.5 Million with a population density of 310 people per Square Km. "Sri Jayawardenapura Kotte" is the name of its Capital City. "Colombo" is the Commercial Capital, based from which only distances for travelling are given from. Sri Lanka's ETHNIC MIX is Sinhalese 74%, Tamils (Sri Lankan and Indian Origin) 18.1%, Muslims 7.1% and Burgers (Dutch & Portuguese) and others making 0.8%. Based on religion, 69.5% are Buddhists (Theravada Buddhism predominant), 15.5% Hindus, 7.6% Christians and 7.5% Islams. Except in rural areas, English is understood and in good use. Sri Lankan currency is Sri Lankan Rupees. One British Sterling Pound is around 160 SL Rupees. The Galadari Hotel Colombo with 446 Rooms, is a "Deluxe Five Star" property conveniently located in the heart of the city over looking the Indian Ocean.